Marketing is not about quick solutions. It’s about execution, and working towards a goal. Why your marketing strategy is probably almost worthless. Why all marketing tactics are about execution. How to make your marketing strategy valuable. And for a marketing strategy that you can execute right now, take a look at our book, The Social Traffic Code. If you prefer reading to writing, you can find the full episode transcript below! Does your business have a problem that could be solved with marketing? Probably – but if you want a solution that happens overnight, look elsewhere. This is Marketing in Minutes – the podcast that’s helping you out with one marketing topic per episode in under 10 minutes. I’m your host Jonathan Gebauer – and today, let’s talk about why Marketing is about being persistent and not about quick solutions. A lot of people think that Marketing is something you simply switch on. And that’s a dangerous idea because it makes poeple believe that marketing problems can be solved at once. And that is only true in very few cases. Back in 2015, Susanna and I both worked on a marketing project for a Startup in the UK. This startup had built an awesome product. What they didn’t have was a marketing strategy. They started working with us because they thought we could easily fix that problem. And we could… Coming up with a marketing strategy for a startup isn’t that hard. What they didn’t realize when they hired us was that having a marketing strategy is worth nothing. The marketing strategy we worked on for them resulted in tasks – tasks, that needed to be performed regularly. Tasks that needed to be performed with care and persistently. Tasks that required them to learn new skills and to outperform the competition. And that was a tough lesson for them to learn! Marketing is only 10 percent about your strategy. 90 percent of marketing is about persistent execution. And it’s those 90 percent of execution where the real value of marketing is. A marketing strategy without execution is worthless. It’s a piece of paper. At best, if you have investors, you can take that piece of paper to them and say: Hey, we have a marketing strategy, we need more money. That might even work. But it still won’t grow your business. Every content marketing strategy involves creating content. And creating content needs time. So it becomes a regular task, that needs to be performed with precision according to the strategy. But it doesn’t stop there. With creating content and publishing content comes the task of distributing that content. Which results in more tasks. For distributing your content you can use several different strategies – all of which result in more tasks. Like social media marketing, or SEO. But that’s still not all of it: All of these tasks that you need to perform will not give you massive results at once. They need time to work. If you decide to work with a guest blogging strategy for building an audience, a single guest post will have almost zero effect. But when you publish two guest posts per week for 3 to 6 months, there is a guaranteed benefit for your business. You will have built many high-quality links, you will have published to a lot of people that didn’t know you before, and you will have converted a lot of those people to your own audience. But that requires consistent execution. It’s no different with any other part of marketing. Marketing is where you have to work hard long before you see the results. It doesn’t matter which kind of marketing tactics we talk about: Marketing is always a process that requires execution. Without consistent execution, your social accounts won’t grow, your SEO traffic won’t satisfy you, your lead generation won’t improve and your sales won’t go up. And there are no easy ways out of that. Back in 2012 Susanna and I were doing the marketing for our first business – exploreB2B. And we were in trouble. We had to fulfill a milestone to get the next batch of money from our investor. And that milestone was measured in marketing success. Or in other words, we had to get a certain number of registered users in a short amount of time. They said, hey, if you invest into advertising using Google Adwords, we’re going to help you set up your campaigns. It looked like it was the perfect shortcut. It was the same promise that advertising pros always make – advertising will give you a massive return on your investment. But most of the time the reality is different: When you start with advertising you will need weeks or even months to set up and test your campaigns until they perform in a way that legitimates your investment. And before you reach this point, you will invest a hell of a lot of money. If you’ve got that kind of deep pockets, and the time, advertising can work for you. But even then, you will need to invest the time and work to optimize your campaigns. We didn’t have either – so we stopped the project after only a couple of weeks – and found our own solutions to our problems. We ended up using data we already had about our business to solve our problem. I told you about it before – we found out that we could use Twitter to invite people to our platform and get a crazy conversion rate. So we used a lot of Twitter automation to invite people on a bigger scale. It wasn’t the easy and quick solution we had been hoping for. It required a lot of hard work – and it only worked out for us, because we already had done the preparations for it earlier. But is saved the day for us. If you are hoping for quick and easy solutions to all your business problems, 90 percent of the time you will be disappointed. But what’s also true is that most, if not all businesses won’t grow at all without marketing. That’s why you should start with marketing as early as possible. Marketing is not the part of your business that you can start when you are ready. When you feel you are ready for marketing, then it’s probably already too late. Instead, you should start your marketing as early as you can in your business journey. Because, if you do that, when you are ready for marketing, your marketing will also be ready for your business. That was all I wanted to cover today. Check out the show notes, which you can find at blog.thesocialms.com/mim-17 – you will find a lot more information about starting your marketing journey. 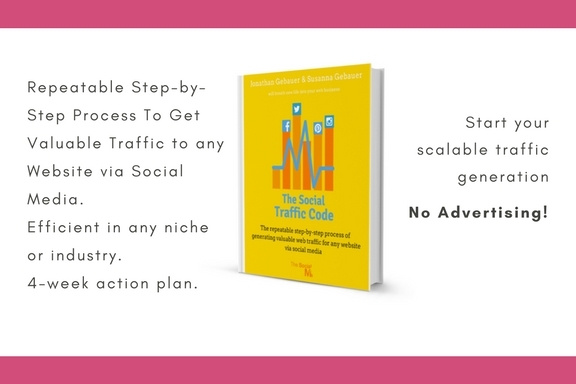 And for a step-by-step guide on how to start your online marketing, check out our book, The Social Traffic Code. 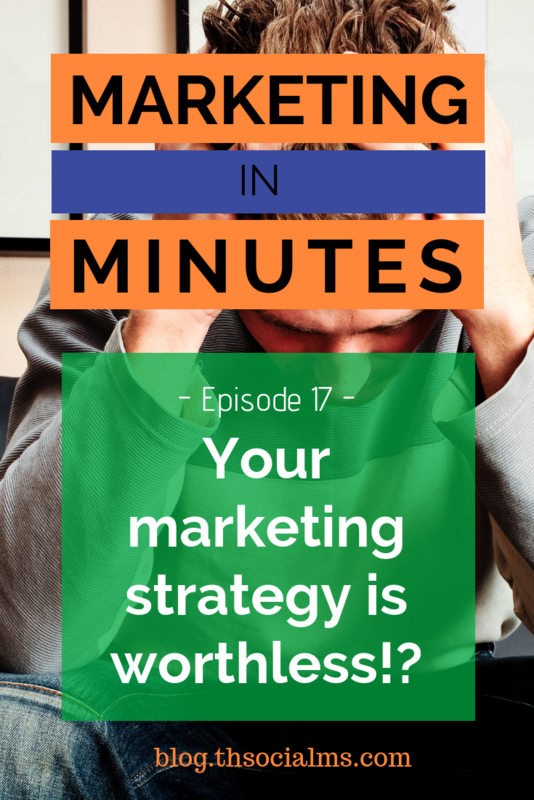 I hope you enjoyed this episode of Marketing in Minutes – if you did, please subscribe to this podcast and return for the next episode. And if you can find the time to do it, leave a review in your favorite podcast app, it really helps us to grow our audience! My name is Jonathan Gebauer and you’ve been listening to Marketing in Minutes. That’s all I have for today, take care, bye!